Annual; culms solitary. Culms erect, or geniculately ascending; 5-15(-25) cm long. Lateral branches sparse; arising from upper culm. Leaves without demarcation between sheath and blade. Leaf-sheaths viscid. Ligule absent. Leaf-blades 1-2 cm long; 1.5-2 mm wide; viscid; aromatic. Leaf-blade surface pilose; sparsely hairy. Inflorescence composed of racemes. Racemes 1; single; bilateral; 5-10 cm long. Rhachis angular. Spikelet packing broadside to rhachis; lax. Spikelets solitary. Fertile spikelets sessile. Spikelets comprising 5-20 fertile florets; with diminished florets at the apex. Spikelets ovate; laterally compressed; 12-15 mm long; breaking up at maturity; disarticulating below each fertile floret. 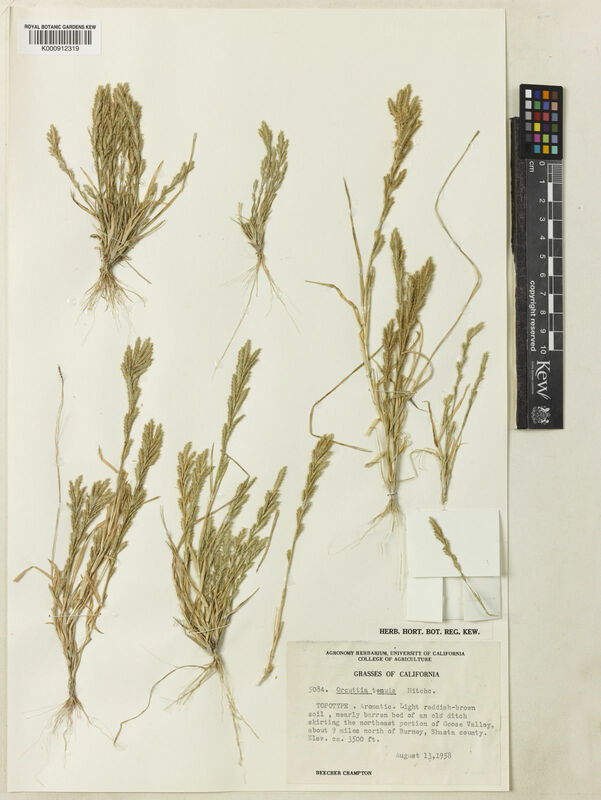 Glumes persistent; similar; shorter than spikelet. Lower glume lanceolate; 3-6 mm long; 1 length of upper glume; chartaceous; without keels; 5-9 -veined. Lower glume apex dentate; 2-5 -fid. Upper glume lanceolate; 3-6 mm long; 0.75-1 length of adjacent fertile lemma; chartaceous; without keels; 5-9 -veined. Upper glume apex dentate; 2-5 -fid. Fertile lemma oblong; 4.5-6 mm long; chartaceous; keeled; 15 -veined. Lemma lateral veins prominent. Lemma apex lobed; 5 -fid; with simple equal lobes; incised 0.5 of lemma length; mucronate. Palea 1 length of lemma; 2 -veined. Apical sterile florets resembling fertile though underdeveloped. Lodicules absent. Anthers 3; 3 mm long; pallid. Stigmas 2; sparsely hairy. Caryopsis with adherent pericarp; oblong; laterally compressed; 3 mm long; light brown; smooth. Embryo 0.9 length of caryopsis.